Lime has been used for thousands of years for building construction as an ingredient in mortar and plasters and limewash. The conversion process by which the material claims its name is from the lime cycle. It is described in most books as a clock face with the corresponding chemical reactions and changes to limestone that take place as it goes through the various cycles. At the noon position on the clock face we have limestone [calcium carbonate – CaCO3]. As we move around the clock-face toward the three o’clock position we introduce heat. The heat needed to convert limestone to quicklime [calcium oxide – CaO] is 1,650F. At that temperature the CO2 is driven off, water is vaporized into a gas at a much earlier stage in the firing process at 212F. From the three o’clock position moving toward the six o’clock position we introduce water to the quicklime. This converts the quicklime into lime putty while giving off an exothermic reaction causing the water to boil in a process called lime slaking. The lime putty [calcium hydroxide – Ca(OH)2] settles down into a consistency of thick Philadelphia cream cheese before its ready for use. The quicklime naturally takes the amount of water it needs and drains off the rest, so in a sense you over soak the quicklime during slaking and the material finds its natural balance as it settles down into a putty under the water – a process that generally takes 60 to 90 days to complete if left undisturbed. Moving now from the six o’clock position to the nine o’clock position we introduce sand, and mix the lime mortar or plaster into a cohesive mixture usually in a volumetric ratio of 1 part lime putty to 2.5 parts sand. We end up at the nine o’clock position with our mixture ready for installation. From the nine o’clock position back to the noon position we introduce water to the walls [by spray misting] in a series of wetting and drying cycles to encourage carbonation. Carbonation is defined as the process by which lime cures – or converts, back to limestone from which it originated. We suggest a minimum of nine (9) wetting and drying cycles to initiate this process after installation. And that’s it! 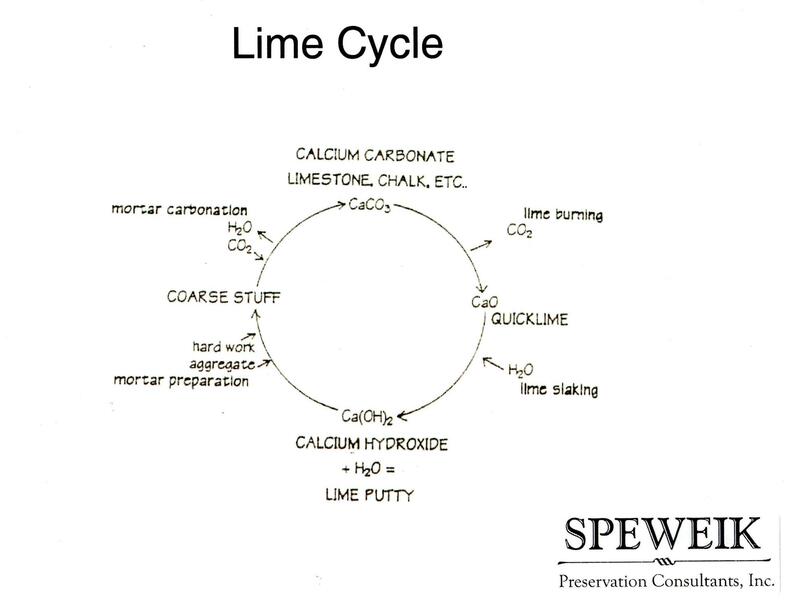 That is the process of the Lime Cycle. We take limestone apart using fire, mix it back up with water and sand and we have lime-stone mortar in the end – a very durable long-lasting material.